It’s the best night of the year for the Hollywood A-list, and this Sunday, London-born Adele will be joining them at the Oscars. Despite her apparent confidence, as she accepted her BRIT 2013 award for best single for her James Bond theme Skyfall, the singer, 24, has revealed that she is, in fact, ‘sh***ing’ herself ahead of her live performance of the songvat the ceremony, during a segment celebrating 50 years of Bond. 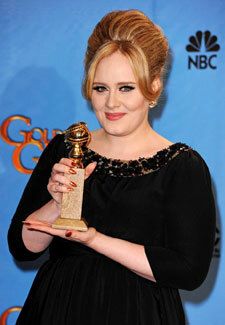 It has also been reported that new mum Adele has undergone hypnotherapy to battle her nerves, not only about singing, but possibly winning the award for Best Original Song. While we’re sure the performance will go without a hitch, what we really can’t wait to see is what fabulous frock she steps out in next!